SHS is one of the leading manufacturers in the airsoft industry when it comes to performance upgrade or repair parts. SHS Airsoft offers you reliability and quality at an affordable price. Super Shooter is a sister company of SHS, producing lightweight, high performance setups. This gear set is constructed out high quality CNC machined heat treated steel and offers durability like no other. 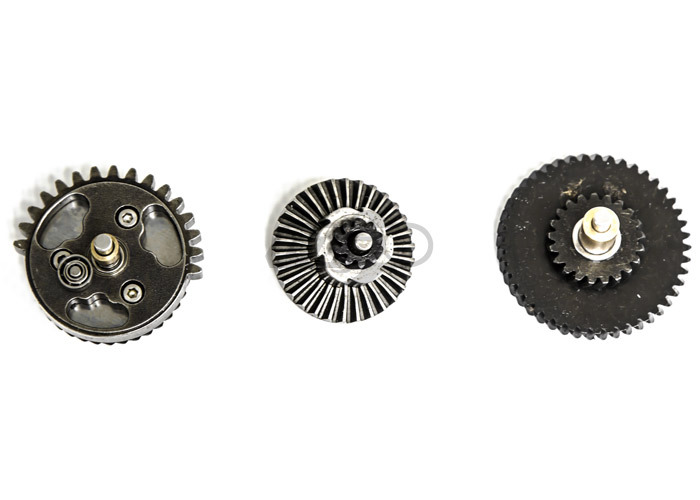 These gears provide amazing torque and are perfect for a high FPS or high rate of fire build. This design features a bearing axis for reduced friction and a larger bearing sector delayer for better feeding In return producing less noise and less heat build up. Will these fit ver2 gearbox???? These will. However, I recommend using the SHS/Lancer Tactical 18:1s instead. I have an arx160 by elite force and I want to pit these in it. No, a standard AEG piston should work in conjunction with this gearset without issue.